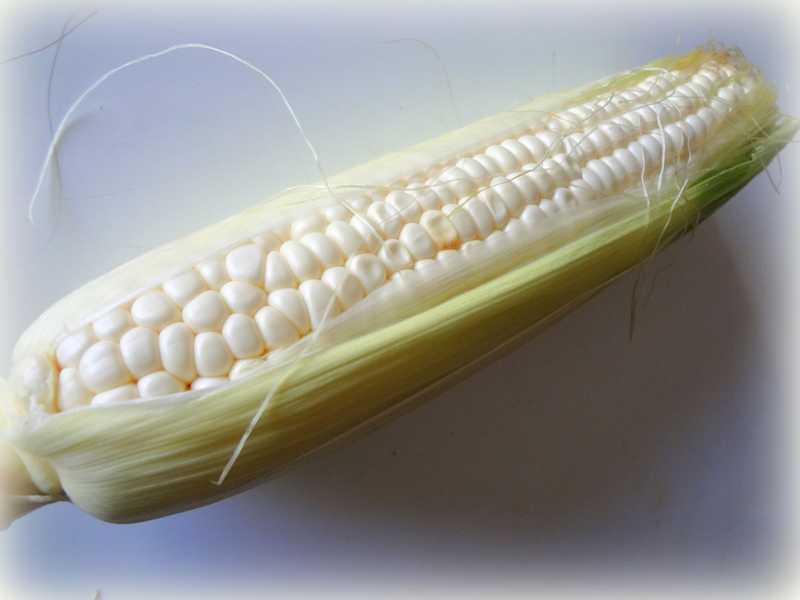 A meal to empty the fridge around a big piece : a roast of white sweet corn. OK, that’s not a Christmas dinner. 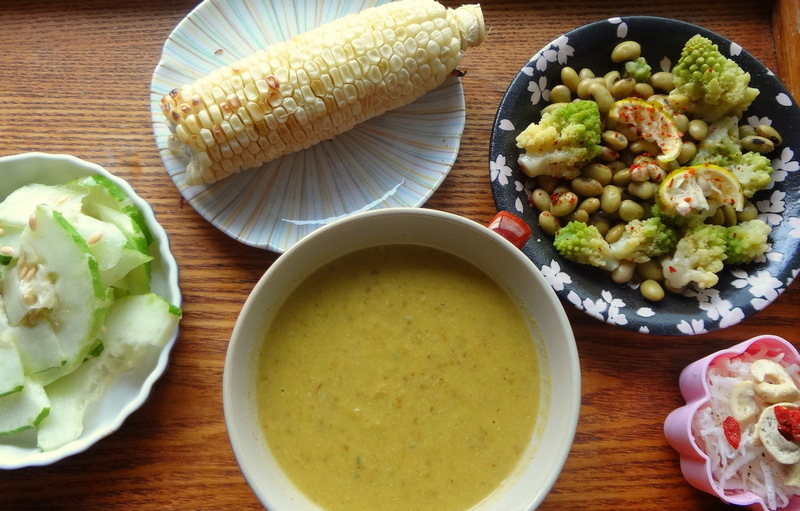 The idea was to use all the parts of veggies I had around before going shopping for fresher produce. 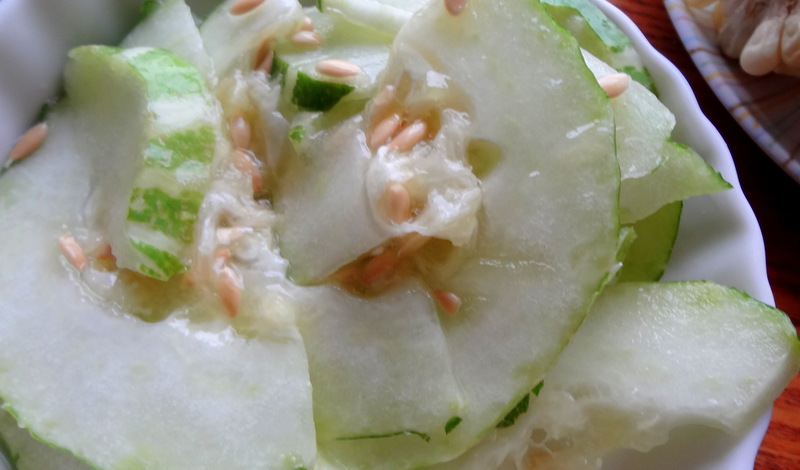 White cucumbers, salted. Rinsed after 20 minutes. They are juicy like melon. 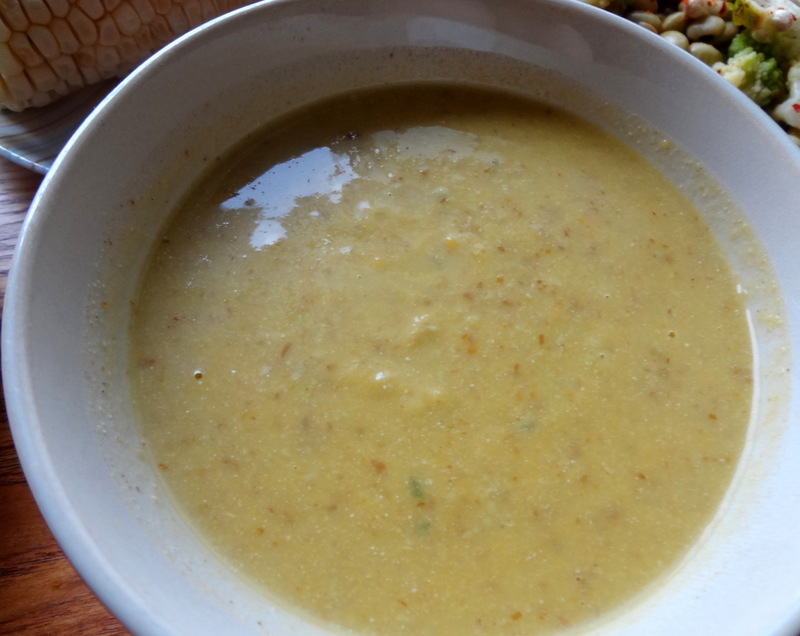 A chilled kabocha and sesame soup. It’s deliciously creamy. 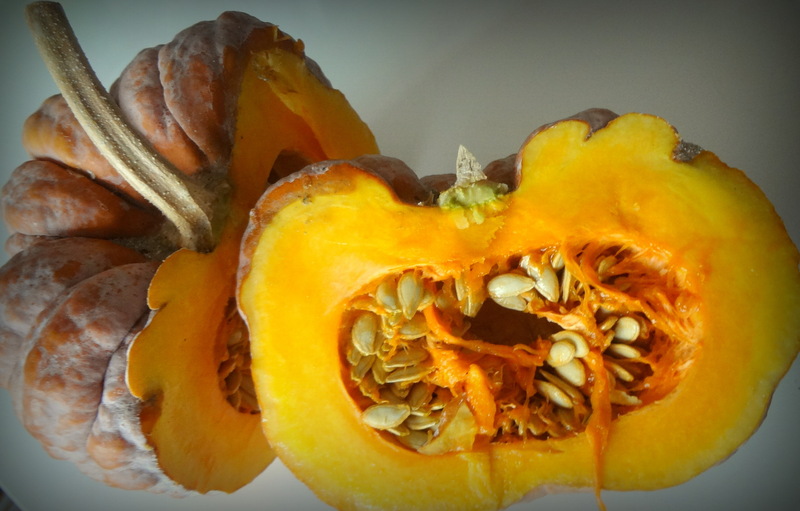 I had used the flesh of steamed kabocha for a salad. The skin is edible. So I used it in the soup. I’ve added sesame seeds, miso, green chili, yellow paprika. Blended. 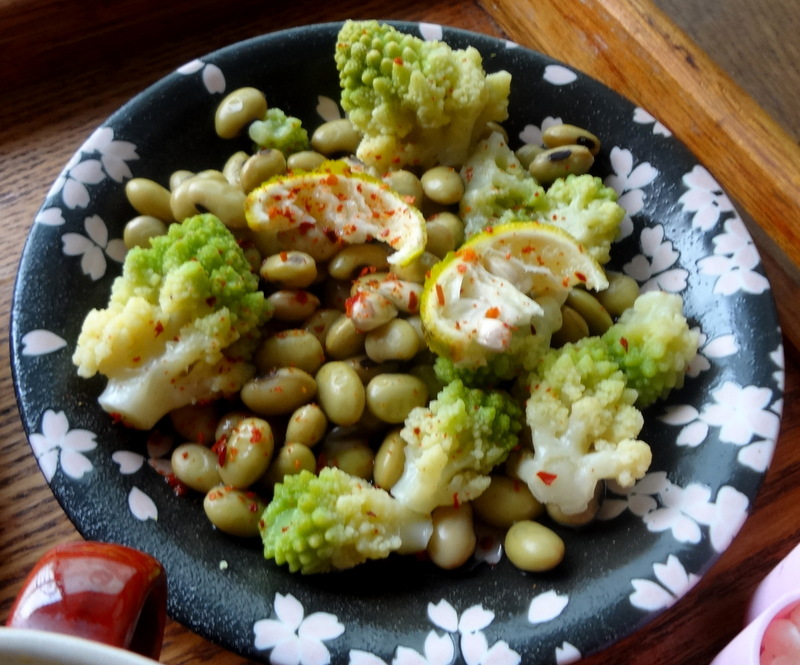 Boiled green soy beans and romanesco were in the freezer. Simply with yuzu lemon and chili flakes. 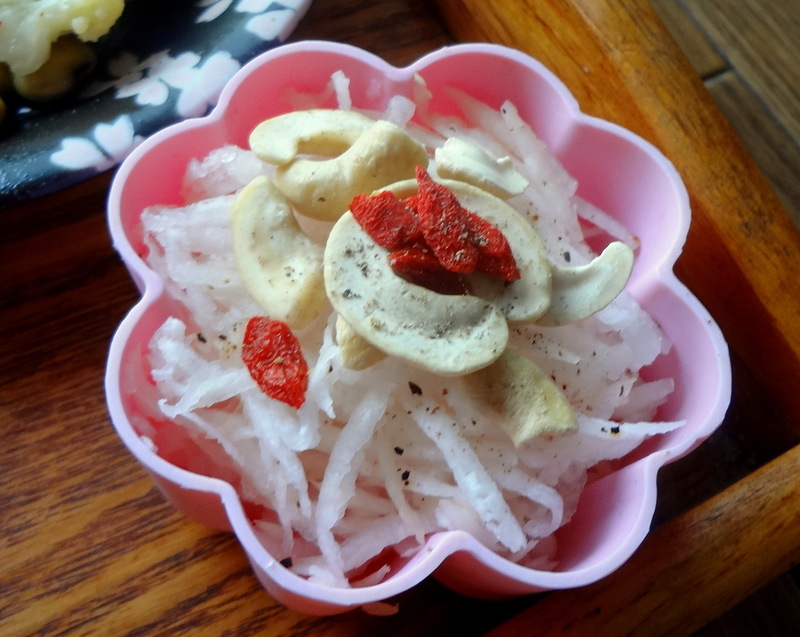 Grated daikon, goji berries, cashew nuts and black pepper. 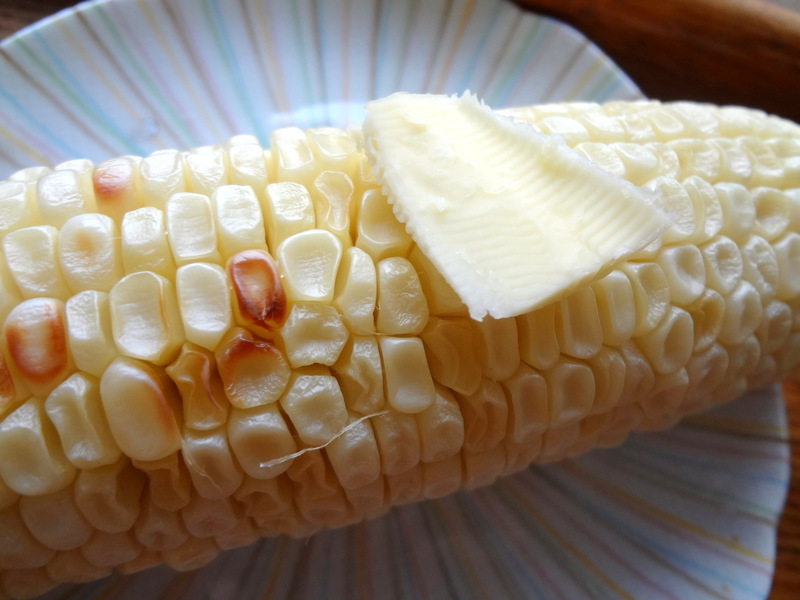 I steamed the corn cob, then grilled in the oven toaster. Yaki-onigiri of red rice, with gomashio (sesame and salt). A Japanese classic with a twist or two. Onigiri are balls of cooked rice, but they tend to be shaped in the hand (nigiri =grasped), so they are like triangles usually. These are perfectly round balls. And they are grilled (yaki). 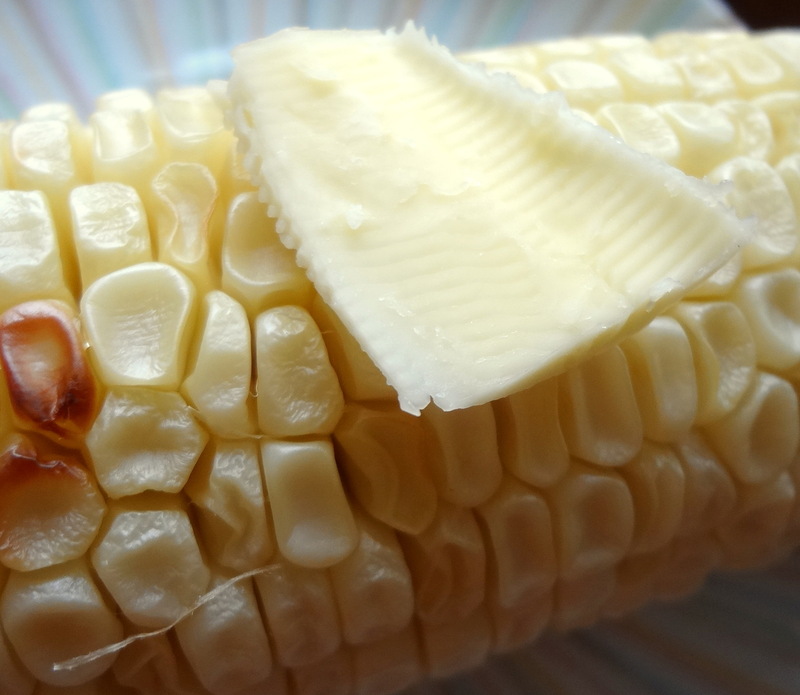 That gives them a crispy crust all around, with a little pop corn flavor. While the reheated rice is very soft. Addictive ! First particularity : instead of plain white rice, I used a leftover of this sekihan (rice with red azuki beans). That’s not forbidden. Any rice leftover will do. If it’s plain you’d want to add some kind of stuffing or flavoring. That’s not necessary here. Then I grilled them in the tako-yaki device. That’s a metal tray with half-sphere holes. There exist some electric machines, some big gas ones for shop, mine is a cheap and small cast iron one that I heat on my induction stove. This mold is not exclusive to Japan. It’s used in different Asian countries. And also in Denmark to make ebelskiver pancakes. I oiled the holes of the hot mold, put rice. Then when they were done, I took out the grilled half balls, put more rice, and a little miso as glue to fix 2 halves together for the miso version (below). Those on top are plain. Miso stuffed version, on lettuce. That’s perfect : it’s raining. What’s the problem with rain ? Hakusai (Napa cabbage) is not only dirt cheap in this season, it is also excellent. I’d buy whole ones , but they are so huge that I can’t finish one by myself. Then something spicy on top : cooked crystal noodles made of mungo beans. They are called harusame (Spring rain). To enjoy with after-meal tea : mikan oranges, peanuts and goji berries.